Last Monday, I reported to work without knowing I accidentally dropped the clinic key in my dresser while shifting things from my weekend bag to my weekday bag. I end up having to wait for superman to report to work (he doesn't have a habit of reporting to work until patient has arrived and our first patient that day was at 11am, just my luck!). He asked me to go for a coffee first but after taking my own sweet time sipping my kopi and savouring my kaya toast and soft boiled eggs, I still ended up waiting for another half an hour or so outside our clinic door. This morning, I had to go down to collect something from a taxi driver who was asked to send me some stuff superman needed to prescribe urgently to a patient. I hurried down after locking the door with a key on my one hand and a clinic phone on the other. The taxi driver asked me to just take the stuff which was seated in the passenger seat behind. After collecting the stuff, he passed me a taxi fare receipt and a loose coin change which he accidentally dropped so I helped him retrieved. Went back happily to the clinic and to my horror, I don't have the key! I traced back everywhere I came from but there was no key in sight. Upon remembering that I helped the taxi driver retrieved the loose coin, it dawned on me that I might have dropped my key inside the taxi. Oh my! Panic mode on! I just feel too embarrassed to ask superman to come to my rescue again so I went back one more time to check whether I dropped it anywhere but still, no key in sight! 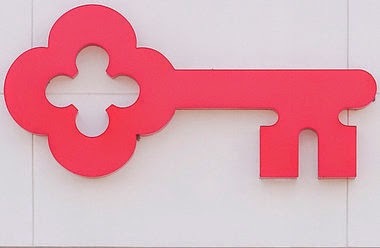 I decided to try my luck and check with the medical centre receptionist whether anyone returned a lost key. Waaaahhh! It happens sometimes, Dokie! My wild guess is that it was the taxi driver who returned the key. May God bless him a hundredfold! There's still a lot of good people in this wicked world. So let's not lose faith in humanity.